Weighty Matters: Should Hershey's recent study lead you to eat more chocolate? Should Hershey's recent study lead you to eat more chocolate? Not according to one of the study's lead researchers. The study involved researchers looking at 45 people who were assigned to either eat a daily 0.8 ounces of cocoa without sugar, 0.8 ounces of cocoa with sugar, or 0.8 ounces of placebo for six weeks. Of the 39 subjects who completed the trial (6 people dropped out of an eat chocolate every day trial? ), "flow mediated dilation" improved in the groups consuming cocoa with no sugar (2.4 %) and cocoa with sugar (1.5%) when compared to placebo (-0.8 %). So are these results impressive? Should you rush out and buy chocolate? 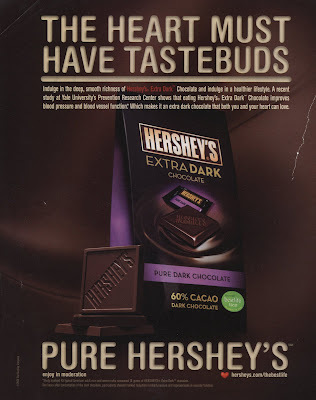 "While the findings from this study do not suggest that people should start eating more chocolate as part of their daily routine, it does suggest that we pay more attention to how dark chocolate and other flavonoid-rich foods might offer cardiovascular benefits"
So what did Hershey's do? Click the ad above for a closer look.